Terrestrial LiDAR of the Massabesic Experimental Forest. Terrestrial LiDAR, or terrestrial laser scanning, is used at the ground level. For hundreds of years, foresters have taken to the woods with tape measures in hand to assess tree inventories. Now this labor-intensive process is getting some high-tech help from University of New Hampshire researchers who are looking at how laser imaging can be used to assist today’s foresters and landowners. Mark Ducey, UNH professor of forest biometrics and management, and a researcher with the NH Agricultural Experiment Station, has been investigating how aerial and terrestrial LiDAR — remote sensing technology that uses lasers — can be used to provide foresters and landowners more accurate and detailed information about their forests. Aerial LiDAR is LiDAR used in conjunction with small airplanes to scan forests and land. Terrestrial LiDAR, or terrestrial laser scanning, is used at the ground level. “We are looking to help foresters and landowners save time and money in the woods. New Hampshire is one of the most forested states in the country as percentage of land base. Our forests support many different goods and services, and much of that land is professionally managed. In addition, a great many acres are under certification to ensure that they are managed sustainably and best practices are followed,” Ducey says. According to the NH Division of Forests and Lands, the annual value of sales and output of the state’s forest products industry totals nearly $1.4 billion. Forests cover 84 percent of the land in the Granite State. “Good management costs time and money. Whatever we can do to help managers do their jobs more efficiently and effectively, will save money and improve outcomes. Giving professionals the tools they need to streamline their work flow and to save time on routine tasks such as inventory, helps everyone all around. It allows them to focus on meeting their other objectives of forest management, and it puts more money in the pockets of landowners,” Ducey says. Airborne LiDAR data for a portion of the White Mountain National Forest. Individual trees and small clearings can easily be see. Preliminary results of Ducey’s research indicate that airborne LiDAR is helpful in identifying meaningful forest features. “The LiDAR helps us focus on the parts of the landscape that are tricky to identify instead of treating the entire landscape as tricky. That is going to save a lot of field time and effort,” Ducey says. Ducey and his research team have partnered with the U.S. Forest Service and National Resource Conservation Service on projects in the White Mountain National Forest to see how LiDAR can help map different ecological site types, from rare plant communities and sensitive soils to wildlife communities and places to manage timber. His research has been funded and supported by the NH Agricultural Experiment Station and the U.S. Forest Service. “This project is informed by everything that the Forest Service tries to do in its planning and management. The old-fashioned way of doing this is really labor intensive and probably not affordable in the long run for the U.S. Forest Service. 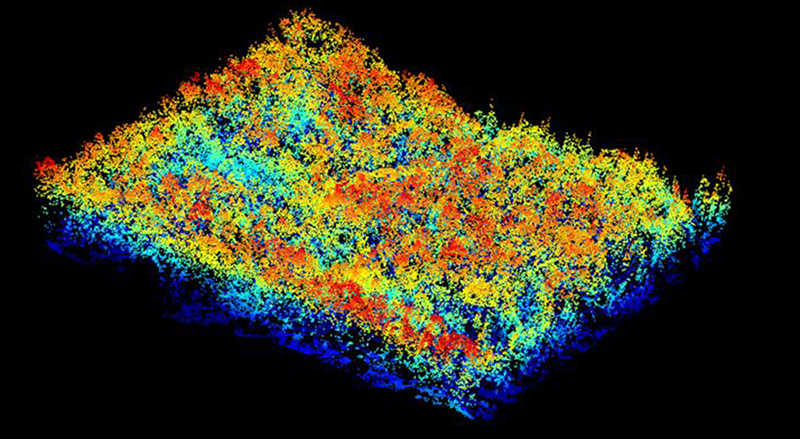 The airborne LiDAR maps land forms and provide an initial guess of what we might find on the land. The role of the field work is then to verify what is there rather than starting from a blank sheet of paper,” Ducey says. Not only does Ducey believe this project will serve as a model for managing the national forests, he believes it will help the National Resource Conservation Service with broad soil mapping and private landowners with inventory management. “There is a lot of really detailed information available with the airborne LiDAR, even at the moderate density that we have used. You can spot things like old cellar holes, stone walls and wagon roads from when an area used to be a field. Just being able to spot old cellar holes, which are hazards, is helpful,” Ducey says. This material is based upon work supported by the NH Agricultural Experiment Station, through joint funding of the National Institute of Food and Agriculture, U.S. Department of Agriculture, under award number 1007007, and the state of New Hampshire.